If you are a LET retaker, you do not need to resubmit TOR, birth certificate, etc. 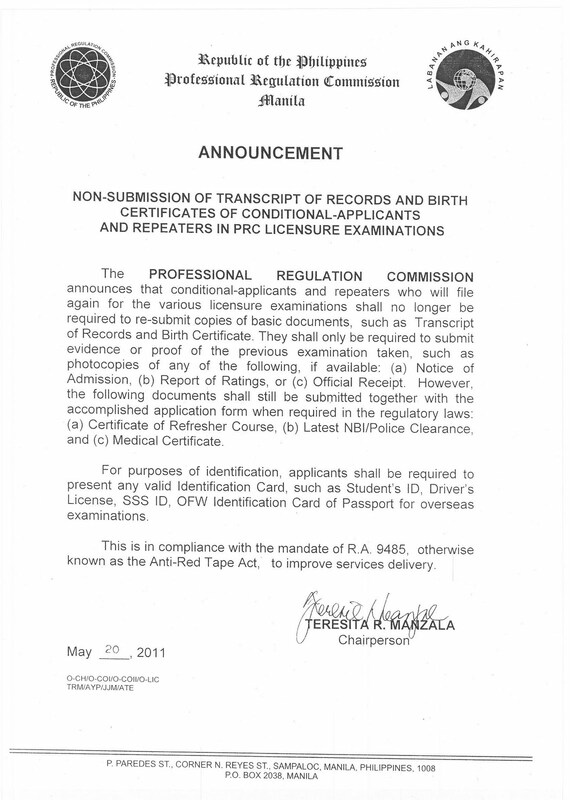 All you need to submit is evidence/proof of the previous examination taken: report of ratings, notice of admission, or official receipt. Also, you need to get a cedula (latest). For purposes of identification, bring an ID: student's, driver's license, SSS, etc. What if you don't have any of these? I think you can go the usual way (i.e. as if you are taking the LET the first time). This one I think was to make the process simpler for those who have already taken the LET. how many times can we take the exam if we already fail? There is no limit to the number of times you can take the LET. (05-26-2011 07:52 PM)admin Wrote: There is no limit to the number of times you can take the LET. is a refresher course a must for a LET repeater? Anybody could advice me what would be the best way I can do, because I have the plan to take my exam and I am searching a reviewer for my major (math). I would appreciate if you can help me. I am here in Saudi, working in a Ceramic Company and I have the plan to take my exam next year.